For so many Philadelphia-area baseball fans, Harry’s rich baritone was not just the voice of Phillies baseball, but the official voice of summer. Harry was there for Schmidt’s 500th, Thome’s 400th and Carlton’s 300th. 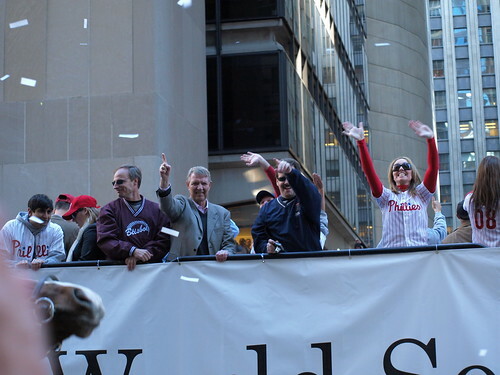 He was there when the Phillies brought the World Series parade back down Broad Street, too. 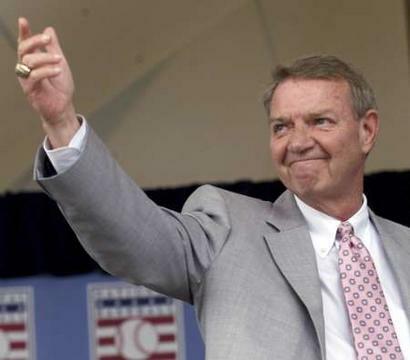 Hearing his voice calling games signaled so many things for so many people. For us, growing up, hearing Harry also meant the end of the school cafeteria food, and the beginning of summer tailgating eats like hot dogs and hamburgers. Ohhh the hamburgers! Granted, tailgating itself has morphed into a virtually year-round event, with sports fans willing (and most times eager) to brave the chilly autumn and winter months to grill, stew and support their team. Oh yeah, and there are some drinks in there, somewhere. There is even a structured following, at www.tailgating.com, which serves as a virtual gathering of all things tailgate, from outrageous rigs to recipes. While that’s a great place to start, we fancy ourselves well schooled in the art of parking lot dining. This IS Philly, after all. We like to sidle up to a spot in Lot K, the eponymous center of the Philly tailgating universe. Since baseball plays two-thirds of its season in the spring and summer months, fans can utilize a wide array of menu options, from slow-cooked chilis and stews to the aforementioned burgers. The debate about the perfect tailgate burger, let alone the ultimate burger in general, can rage well beyond a 9 inning game. We decided to settle on a delicious pub-style burger, using a recipe from the uber-detailed Cook’s Illustrated magazine. Caveat: you’ll need to either: a) purchase a subscription, or b) sign up for their 14-day-free-trial in order to view the full recipe. The biggest departure for us, and this recipe, was the beef itself. Many folks tend to go with low-end, pre-ground ‘hamburger blends.’ This mixture can vary wildly between retailer to retailer, depending on where it is ground. For example, some retail stores grind their meat off-site and ship to their locations. Many have in-house butchers who grind their meat early in the day. 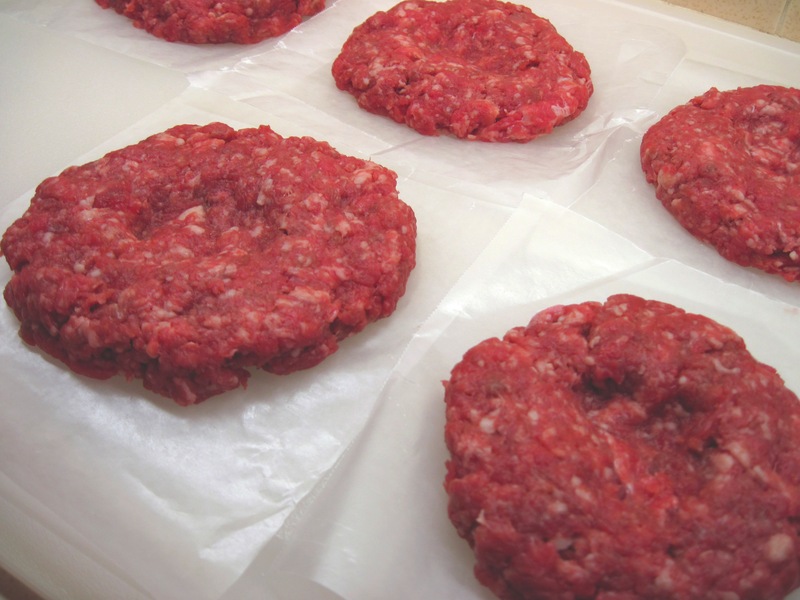 Either way, the stores have tremendous leeway in terms of additional fats or seasonings that can be added to hamburger, while ground beef must remain ground beef. 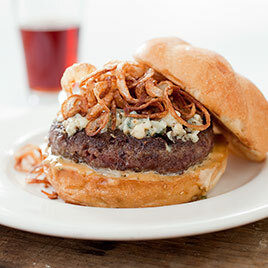 The Cook’s Illustrated pub burger calls for whole sirloin to be cubed, chilled and pulsed in a food processor. We chilled our sirloin for just under an hour and pulsed in our Cuisinart, until we reached a medium coarse consistency. After, the addition of melted butter and the desired seasonings (we need to leave something to the imagination), produced a burger unlike what we were used to as kids. Grinding meat at home, whether through a food processor or meat grinder, provides a markedly different texture. This burger turned out much more dense and fulfilling. Texture isn’t the only variable when choosing a cut of meat; flavor is another. While we used purely sirloin, many restaurants use varied combinations of sirloin, flank, brisket and chuck steak (not to be confused with chuck roast). Whatever the combo, folding in between 20 to 30 percent of fat into your mixture will produce a truly succulent patty. So, grinder or food processor? The gear nearly as important as what goes inside, to be sure. 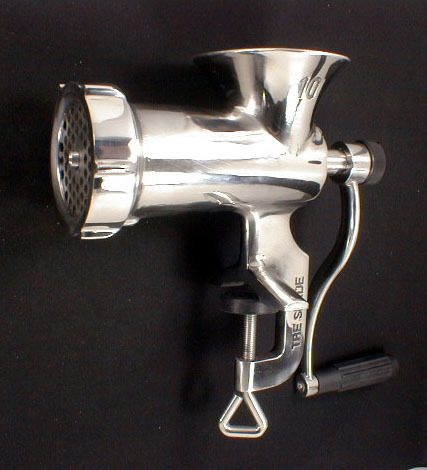 While many kitchens are equipped with some grade of food processor, not many boast a meat grinder. Even so, meat grinders are kitchen work horses, capable of grinding ingredients for cakes, relishes and other non-burger items. We feel all warm and cozy about the Tre Spade-brand grinders. They are Italian made with a solid cast stainless steel body and handle, making them pretty and powerful. After the beef is ground and seasoned, you’re set to cook. Cook’s recommended a quick, dark sear to their patties, followed by a bake in the oven. This is a method similar to the way many restaurants prepare a steak, searing in a pan for flavor, followed by the finish in the oven. Both methods call for a resting period after coming out of the oven, which allows for the juices to stay put, and for the cooking process to ginish. To mimic true tailgating conditions, we headed straight for the grill. We made to include a wide indent in the middle of each patty, to prevent them from ballooning into quasi meatballs while cooking. We also made sure not to press any juices out on the grill, or to practice ‘helicopter cooking’ by hovering over them, constantly flipping. A few minutes per side is just fine, thank you. There are also plenty of forks in the road (food pun) you can take. If you’re looking to achieve uniformity, something like the Adjustable Thickness Hamburger Press could be more your speed. It allows you to form identical size and shape patties. Or, something like the Ham Dogger [discontinued] could work, if you’re looking for a more unorthodox option. Whatever the final shape is, we recommend grinding and shaping your patties the day of your tailgate, rather than freezing. As you can see, we can only start you off on the path to true burgerdom. The total experience is user-driven and interactive, much as the entire tailgating experience. It’s about finding the recipe and execution that works for you, cracking a cold drink and cheering on your team, even if it’s from the parking lot. With that said, here’s a little High Hopes, from Harry himself.